We do not currently haven’t any vacant positions. Please check back soon. Would you like a career at FAJ? 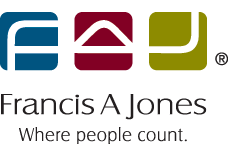 Francis A Jones is a medium sized practice providing a complete range of business solutions to our clients. We have a successful business history covering more than 85 years of practice in Fremantle. A significant ingredient in our recipe for success is our ability to recruit and retain an outstanding selection of professional and support team members. More than one in three of our team have been with us for over ten years – a record that is the envy of our industry. At Francis A Jones we have extremely high values based around providing services that are always in the best interests of our clients, for a fee that reflects fair value. When we engage new team members, we only accept people that are like minded, will embrace our core values and fit into the FAJ culture. Our focus is on FAJ remaining the place “where people count”. We provide comprehensive training and education for all team members, who are mentored and gain valuable experience under direct supervision of FAJ Directors and senior professionals. We also offer flexible arrangements for employees who are completing their studies on a part time basis. Where no positions are vacant we may retain suitable resumes until vacancies arise. Please note that we may not respond to all applications.